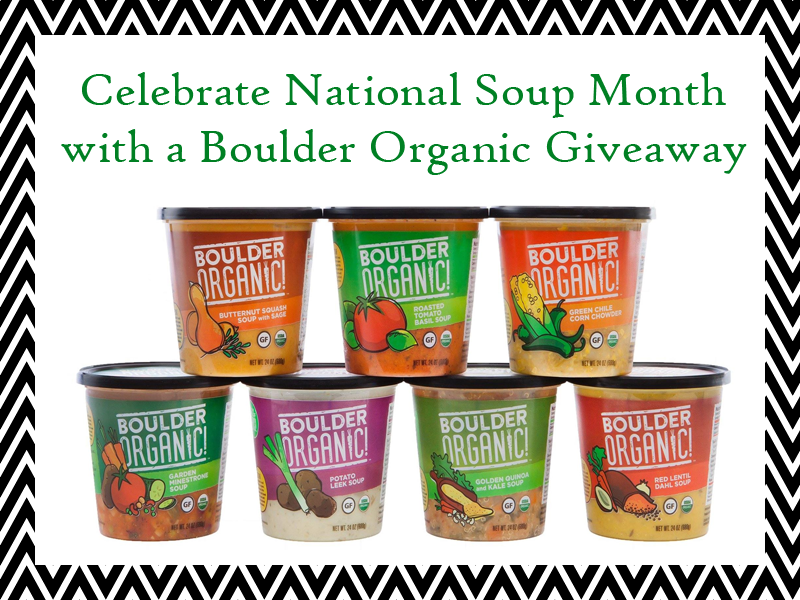 Celebrate National Soup Month with a Boulder Organic Foods Giveaway! **Coupons received for consideration, all thoughts are my own. The cold weather has finally arrived! And in my family, when the cold weather arrives, there is nothing we love more to warm us up than a nice hot bowl of delicious soup! And we're not the only ones! Who doesn't love some delicious soup and crackers, or soup and grilled cheese on a cold January day? It's no surprise then that January is National Soup Month! Personally, I love making soups from scratch when I'm able to, but with two kids and a busy schedule--- well, I don't always have the time for that! But I still want to give my family delicious soups, with high quality, good for you ingredients. Thankfully, Boulder Organic Foods has us covered! These soups can be found in the refrigerated deli section at many locations across the country including select Targets and Fresh Markets – please check the locator for a retailer near you. With so many delicious varieties to choose from, we can have great tasting soups that are good for us too! These should be a staple for all of our winter menus! I am trying to eat healthier this year so I would like to try these organic soups to see if I like them. I would love to try these soups! They sound so good! I would love to try these soups - they do sound awesome. I love soup and haven't been able to make any for a long time! Huge fan of soup. I eat it a lot. Would love to try this brand. Like you, I think winter is perfect soup weather. My husband not so much. But these look so good, I'd love to try them. This is a great selection of soups - several of these I would normally make from scratch. I am happy to see they are available at Target! These soups look great and would be fabulous for lunch on these freezing cold days! I looked at my local grocer and they don't carry this soup...yet. I talked with the natural food manager, and he is going to get it ordered. I am really excited to try it. It looks really yummy. I thank you for featuring such a great and delicious giveaway. I would love to try this soup.